Whether or not you believe that true love is written in the stars, celestial love is yours for the wearing with a starscape pendant personalized and on based on the birthdays of you and yours. This customized jewelry is made possible by a new Massachusetts startup, Matter Labs, and their off-shoot jewlery line Dyo (Design Your Own). Founded by MIT grads, Dylan Reid and Greg Tao, Dyo is an easy to use online platform that puts the power to design jewelry in your hands. Simply create the design and the folks behind Dyo will bring it to life using state of the art 3D printing. 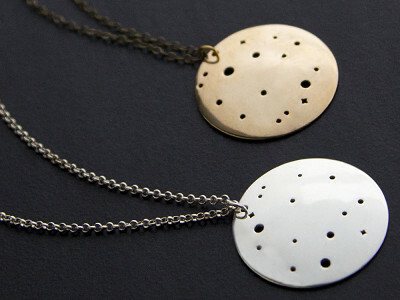 In partnership with Dyo, The Grommet is offering a limited run of Dyo Star Pendants ready and waiting to be customize based on the astrology of your choice. Available in your choice of silver or bronze, this keepsake lets you wear your heart on your necklace. Hey There - We're Dyo and we make products that are awesome because they're designed for you. We use cutting edge technology and 3D printing to bring production level quality and convenience to you at an artisanal scale. We think the things you buy and choose to wear should tell your story, which starts with you. Happy to answer questions, so ask us anything! Hey Everyone! Dylan from Dyo here. You can now preview your designs BEFORE buying them. Click here to preview your pendant. Just click the "Design + Order" button and enter in your birthday's day and month. @Dylan What is the diameter of the pendant? Thank you!!! Hey @Linda it's 32mm in Diameter! Could I see an image for Gemini and Taurus. Thank you so much. Hello. Would you please show me how Aries and Libra would look? Are you able to post images of the different signs? Specifically, Aries and Pisces? Very cool! I'd love to be able to see the constellation image prior to purchase. What is the DYO website address? @Christina - it's Dyo.co. If you know which birthdays/ constellations you'd like I can post a preview! @Dylan Scorpio and Sagittarius. Thank you! @Dylan - Nice, but I can't figure out the constellation images. Can you do them separately so I can figure out the combined image? Thank you! can the pendant be made to a smaller dimension? @Guest Unfortunately, we are currently not offering custom requests at this time. So I just ordered a silver pendant. Will you guys be sending me an email so I can give you the birthdays? Hey @Michael, you should be getting an email with a code from the Grommet so you can put in the birthdays yourself. Please email The Grommet Customer Experience Team if you continue to experience any issues at [email protected]! Are you getting one for $100 or two? @DYLAN - I love this concept. Would I be able to see what Pisces and Sagittarius look like? Thanks! Can you show me Gemini and Cancer? Thanks! I have ordered and paid for a silver pendant but when I went to the site to manually order it (per the e-mail received), there is no response when I hit enter. Is there a phone number I can use to speak with someone? Sorry about that @Vickie, glad you were able to figure it out! I love your idea guys. Could you show me what Sagittarius and Leo would look like? And do you know what the approximate delivery time would be? Thanks. How about Libra and Capricorn? Love the idea and look of them. I'd like to know if they will tarnish and if so which metal would tarnish less. How would I go about cleaning them? Would silver polish ruin the look? Would making them in stainless steel be a possibility? What would Cancer & Capricorn look like? I placed my order today for the silver pendant and I have been trying to input my voucher number for a few hours now and your site isn't working. Can you please help!!! Amy from The Grommet here. Sorry to hear you are having trouble. We'll email you directly right away regarding this issue so you can get it resolved. Look for it soon. Really like the concept very innovative. Great gift for someone who has everything. Would have liked to go in and actually design the piece first to see if I like it - but it does not look like you can do that. You have to actually buy it first then design it? I went to your Website and it sends me back to The Grommet. Hey @Bruce - we're working on a better solution. But in the meantime if you'd like to see a particular pendant we can create a preview and send it over to you. Can you shine a light behind them to illuminate design on dark surface or is it too small? Hey @Maureen - if you have the right sized light (small, concentrated beam) it makes for a fun projection on a wall or other surface. What would Pisces and Scorpio look like? How much would it cost? Thanks. Hey @Susan - you can now create your own preview at https://dyo.co/pendant-star. Let me know if you have any trouble and I can upload one for you. What happens if you have the same birthdate? Would it just show one version of the constellation? 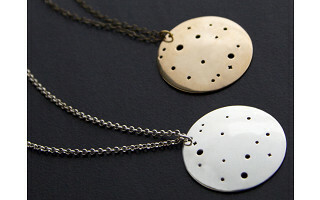 The pendant will show one big constellation in the middle, not a repeating pattern of the same constellation. Hi, what would Pisces and Taurus look like? Thank you! Whether or not you believe that true love is written in the stars, celestial love is yours for the wearing with a starscape pendant personalized and on based on the birthdays of you and yours. This customized jewelry is made possible by a new Massachusetts startup, Matter Labs, and their off-shoot jewlery line Dyo (Design Your Own). 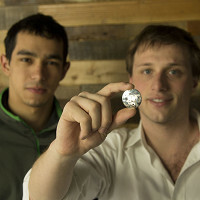 Founded by MIT grads, Dylan Reid and Greg Tao, Dyo is an easy to use online platform that puts the power to design jewelry in your hands. Simply create the design and the folks behind Dyo will bring it to life using state of the art 3D printing.